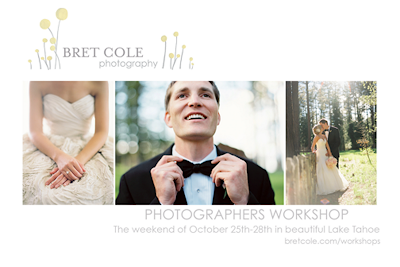 I have the amazing opportunity to work alongside several other talented professional to put together a vignette for the Bret Cole Photography Photographers Workshop. Needless to say, I'm pumped. Bret approached me after talking with the talented Becky Hawkins of Sugar Plum Invitations, and now I get to make pretty paper goods for her and her 'students' to shoot. If the photos on her website are any indication (they're amazing, by the way), then this is going to look damn good when it all said and done. It's not easy to take such beautiful pictures. Come back soon for more details on what I'll be working on. Oh, and head over to her site to check out her work and sign up for the workshop. If I wasn't going to be vacationing at that time (and if I had any eye behind the camera), I'd totally be in!